Getting booked for a new interior design job is always a great feeling! 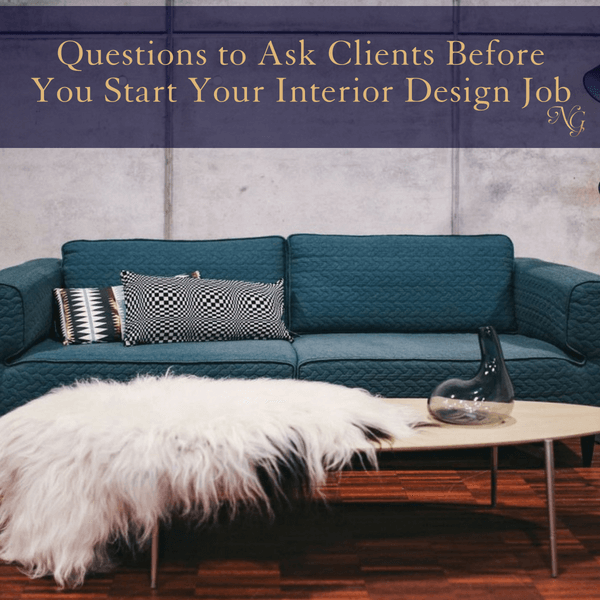 If you are new to working with clients, one thing you might have experienced is regretting NOT asking all the right questions! You had a great consultation. Good vibes were all around and your sales strategy was on point. Then the job is about to start, and you realize there might have been some more preliminary questions you should have asked to make all the happenings of the “start day” more efficient and less confusing. Not to worry! We all go through the process in one way or another. Let me give you a helping hand and reveal some questions you should be asking. This gives your client the opportunity to make sure all their wants, suggestions and last-minute design changes get expressed. Anything they may have forgotten to bring up they will bring up when you ask this question. Do You Already Have Some Purchases Made? At times you may come across a client who has already bought some furnishings, supplies or accessories. Now, they just need your creative expertise to put it all together. In the case where nothing has been purchased yet, you will want to find out if they plan on doing any of the purchasing themselves or would they like you to handle it all. This is super important so you don’t have any confusion along the way and you can set the boundaries and pricing accordingly. 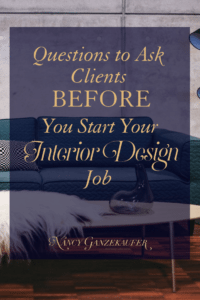 Sometimes clients may come to you already having an idea of the contractor they want to go with. Maybe it is someone they worked with in the past. Perhaps they are going off a referral from a friend or a relative. So, just to be sure there is no confusion, be sure to clarify this! If they already have someone specific on their minds, you want to know right away. If not, then feel free to present the contractor options you have in your circle. Do you feel like you need to expand your resources of contractors? Check this out. What Time(s) Do You Want My Team Working? Every client is going to be different when it comes to this. You want to be sure you are being sensitive to what they need time-wise. Some clients have families and they don’t want work done while the family is home after work and school. Some clients may not care about this at all. It is best to come together on this topic from the beginning to make sure all parties can commit to the right times. What Is the Time Frame You Want This Project Finished? As we wrap up, here is a little exercise you can do. Make up your own list of questions. Google some questions or talk to friends in the industry about the questions they ask. Compile the list and highlight the ones that really resonate with you. Feel free to share what you come up with on this platform!